While strictly complying with commercial ethics, the Group continually endeavours to make contributions to society, practice its belief of being a responsible corporate citizen in every aspect of its operations. The ZDHC MRSL V1.1 is a list of chemical substances banned from intentional use in facilities that process textile materials and trim parts in apparel and footwear. The MRSL establishes acceptable concentration limits for substances in chemical formulations used within manufacturing facilities. The limits are designed to eliminate the possibility of intentional use of listed substances. The intent of the MRSL is to manage the input of chemicals to the suppliers and remove those hazardous substances from the manufacturing process. It is a living document and will be updated as needed to expand the materials and processes covered and to add substances that should be phased out of the value chain. On 4 May 2015, the Zero Discharge of Hazardous Chemicals (ZDHC) Group - comprised of signatory members adidas Group, Benetton Group S.p.A., Burberry Group PLC, C&A, Esprit, G-Star Raw C.V., Gap Inc., H&M, Inditex, Jack Wolfskin, Levi Strauss & Co., Li Ning, L Brands, M&S, New Balance Athletic Shoe, Inc., NIKE, Inc., PUMA SE and PVH Corp and associate members, including the Association of the German Sporting Goods Industry (BSI), Everlight Chemical (ECIC), European Outdoor Group (EOG), GermanFashion Modeverband Deutschland e.V., JINTEX Group and Stockholm International Water Institute (SIWI) - issued the ZDHC 2014 Annual Report. The results presented in this report illustrate the focus on results including the development and deployment of chemical management tools and commitment of the ZDHC community-signatory brands, associate members, textile chemical industry and supply chain industry associations, environmental and social non-governmental organisations, suppliers and the academic community-during the past year to work towards the goal of zero discharge. You can view the report at http://www.roadmaptozero.com/. 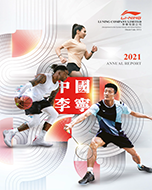 Li-Ning continues to actively contribute to the Zero Discharge of Hazardous Chemicals (ZDHC) Group 2020 goal of zero discharge. On 5 June 2014, the ZDHC Group reached a significant milestone by issuing a Manufacturing Restricted Substance List (MRSL), a first for the apparel and footwear industries.